The state legislature is asking voters whether Missourians should have to have a photo ID to vote. 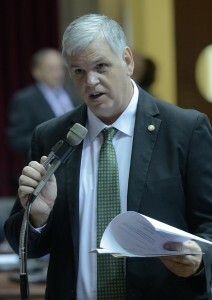 The House and Senate voted to ask whether the state Constitution should be changed to allow for a photo ID requirement. Such a change is necessary because a 2006 ruling by the Missouri Supreme Court found a previous voter photo ID law to be unconstitutional. “We have to change our Constitution in order to allow voter ID to pass. That seems problematic to me,” said Representative Lauren Arthur (D-Kansas City). The question could be put to voters in August or November. Democrats say that requirement would disenfranchise voters, particularly those who might lack documentation needed to get a state-issued ID such as birth certificates. Republican supporters say no voters would be disenfranchised after they led passage last week of a bill that would lay out how voter photo ID would work in Missouri. It would allow anyone without a photo ID to sign an affidavit, swearing under penalty of perjury, they don’t have one. Such an individual would then be allowed to vote, and the state would pay for that person to get a photo ID including paying for the supporting documentation. “I don’t see how a single person under this, under HB 1631, or if this is put into our state Constitution, how a single voter is disenfranchised. It simply is not true,” said Representative Justin Alferman, (R-Hermann), the sponsor of the bill passed last week. That bill cleared both houses with enough votes that if no lawmakers change their votes, a veto by Governor Jay Nixon (D) could be overturned. Republicans argue the requirement would fight voter impersonation fraud – something Democrats say doesn’t happen.